New York City is where dreams are made of whether it is your career goals or fitness goals. The Big Apple is known for its diversity and fast-paced environment. Don’t lag behind because you’re not in shape. With such a wide variety of gyms at your fingertips, there’s no reason not to work out. In order to save you time, we have compiled a list of top-quality gyms worth checking out in New York City. There are so many amazing options in and around the city we’re sure you will be able to find an awesome gym that fits your needs. Whether just visiting or living in NYC full-time all of these gyms are sure to exceed your expectations! If you’re in the Manhattan area you absolutely have to check out Manhattan Plaza Health Club. My experience was incomparable to any gym I’ve experienced before. I went there thinking I would spend maybe 2 hours max and ended up being there for 4 hours! I got an awesome recommendation from Sherman to try the yoga class. After I finished, I enjoyed some rock climbing and got a soothing deep tissue massage. But, I couldn’t stop there! I had to try out the whirlpool, sauna and steam room, which did not disappoint and were super relaxing as well. Unfortunately, I didn’t get to try out the weights this time around, but next time I visit NYC I will for sure! 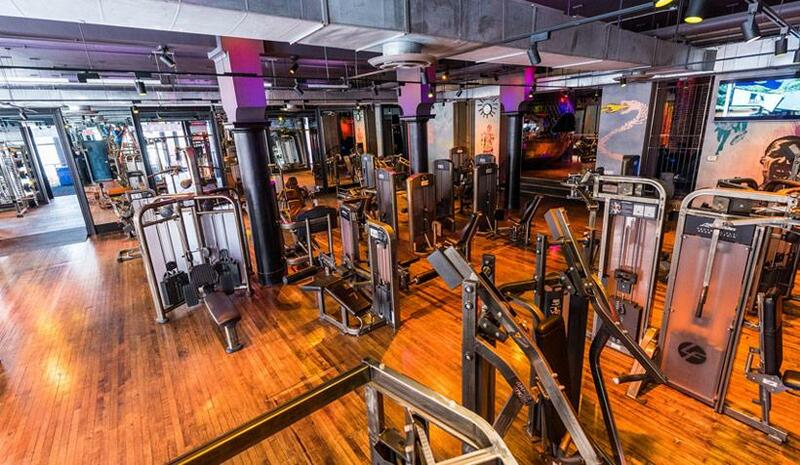 During my visit to NYC, I had to check out the Soma Williamsburg gym. I had heard a lot about this gym from reading a Naked Apartments blog. This gym is packed with fun classes that will definitely make you feel the burn! While I was there I had to try the Zumba and Spin classes. Let me tell you, you have to be in great shape to make it through spin – which I am not. Even though spin was a bit of a struggle I still enjoyed it. The teacher was very helpful and it served its purpose in burning off the giant slice of pizza I ate the night before. Zumba was a ton of fun too! I got a kick out of learning the dance routines to the upbeat music selection. Before starting my workout I had a chat with Justin at the front desk to get a recommendation on which class I should take. I took his recommendation and ended up trying out the Capital Gains class and was not disappointed. This workout is a little more weight lifting intensive than I’m used to, but I definitely think it was well worth the sweat and was a great experience. This gym is like nothing I’ve experienced before. They have a live DJ so there is no need to bring your tunes. I wasn’t able to get around to it, but Astor Place has massage chairs to sit back and relax in after you’ve worked hard in the gym. From the music to the lighting this health club really feels like a club! Overall, I had a really good time at this gym. The club was near spotless and the complimentary fitness assessment was a nice touch to help me determine where I stand with my fitness goals. This gym has a lot to offer and is perfect to fit a wide variety of fitness needs. Core area, Blink FiDi. Public image courtesy of Google. For my workout, I decided to hit the free weights floor and get my pump on. As I said before, they have a good selection of free weights and all were racked in the correct place (always a big plus!). I stuck with the lighter free weights and was able to make good use of one of their squat racks. Based on my experience, I would recommend this gym for those who love a traditional workout and don’t like all the hustle and bustle of a class. It’s great if you want one on one personal training and it’s cost effective too. Practicing form at CrossFit 5th Ave. Courtesy of Google. The employees were very helpful and kind when teaching me some of the moves. This particular box puts a huge emphasis on correct form and safety which I definitely want to highlight as a great quality. This was only my 5th time taking a CrossFit class. As a novice, I didn’t get an amazing workout as I’m still in the process of getting my form right, but I feel like the guidance I received from 5th Ave will help me a lot on my journey. For a CrossFit “box” 5th Ave is spotless. To wrap it up I think this has to be the best CrossFit gym in all of NYC! The energy was great, the instructors were great, and the workout left me feeling pumped and ready to go.